The B2, S. C. Gr., which is the principal Italian antitank mine, is a rectangular metal box, 3% feet by 5 inches by 5 inches, weighing 33 pounds and containing about 7 pounds of explosive. charge is placed in both ends of the box, and the firing mechanism is in the middle. The striker is held clear of the cap by a wire. When the lid is pressed down, this wire is sheared by a knife edge on the underside of the lid. (a) Search for booby traps and neutralize them. (b) Open both inspection lids gently. (c) Remove the cap holder carefully, but do not touch the lever. (a) Pull clear with 50 yards of cable. 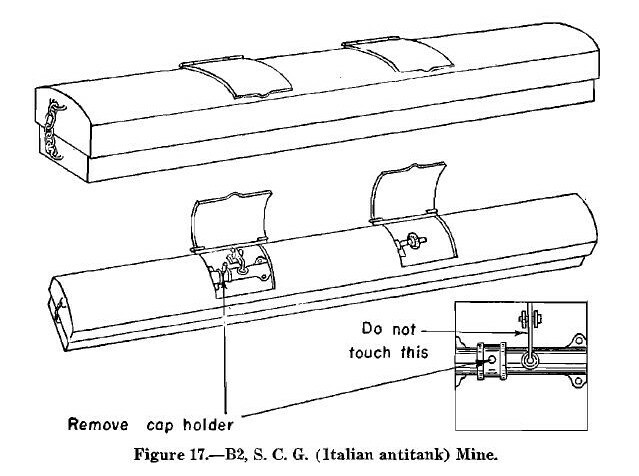 (b) If the mine is still intact, carry out (b) and (e), as above. *There is a newer model of the B2, which has a safety-pin hole between the cap holder and the lever. When neutralizing this model, insert the safety pin or nail or stout wire through the hole before removing the cap holder.